You may have noticed that the design of the ScraperWiki site has changed substantially. As part of that, we made a few improvements to the documentation. Lots of you told us we had to make our documentation easier to find, more reliable and complete. We’ve reorganised it all under one contents page, called Documentation throughout the site, including within the code editor. All the documentation is listed there. (The layout shamelessly inspired by Django). Of course, everyone likes different kinds of documentation – talk to a teacher and they’ll tell you all about different learning styles. Here’s what we have on offer, all available in Ruby, Python and PHP (thanks Tom and Ross!). New style tutorials – very directed recipes, that show you exactly how to make something specific in under 30 minutes. More on these in a future blog post. Reference documentation – we’ve gone through it to make sure it covers exactly what we support. Links for further help – an FAQ and our Google Group. But also for more gnarly questions asks on the Stack Overflow scraperwiki tag. We’ve got more stuff in the works – screencasts and copy & paste guides to specific view/scraper libraries (lxml, Nokogiri, Google Maps…). Let us know what you want. Finally, none of the above is what really matters about this change. The most important thing is our new Documentation Policy (thanks Ross). Our promise to keep documentation up to date, and available alike for all the languages that we support. Normally in websites it is much more important to have a user interface that doesn’t need documentation. Of course, you need it for when people get stuck, and it has to be good quality. But you really do want to get rid of it. But programming is fundamentally about language. Coders need some documentation, even if it is just the quickest answer they can get Googling for an error message. We try hard to make it so as little as possible is needed, but what’s left isn’t an add on. 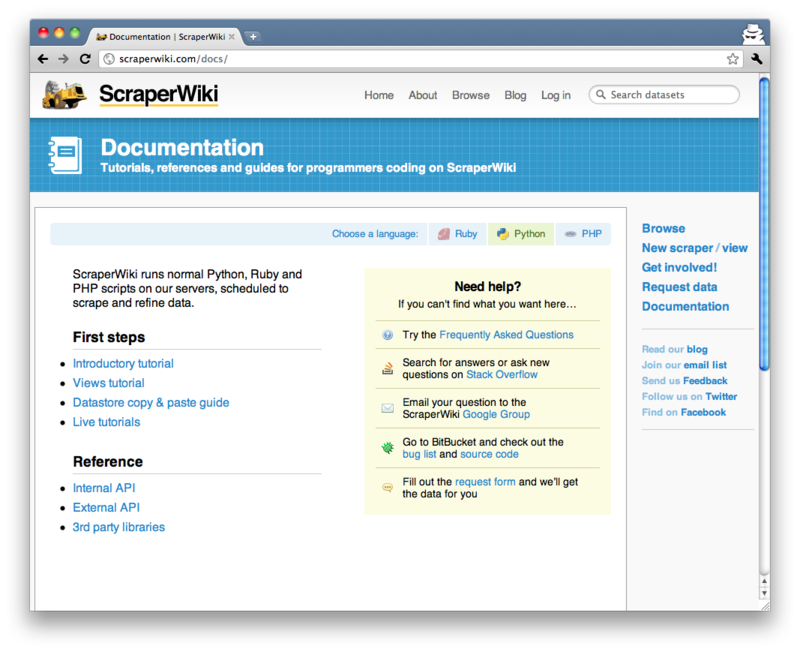 It is a core part of ScraperWiki. I disagree. When documentation is bad it isn’t better than nothing. It is worse than nothing (if that’s possible), because thr user is stuck and now has no place to go.